The Proteome Comparison Service performs protein sequence-based genome comparison using bidirectional BLASTP. This service allows users to select up to eight genomes, either public or private, and compare them to a user-selected or supplied reference genome. The proteome comparison result is displayed as an interactive circular genome view and is downloadable as a print-quality image or tabular comparison results. The Proteome Comparison submenu option under the Services main menu (Protein Tools category) opens the Proteome Comparison input form (shown below). Note: You must be logged into PATRIC to use this service. Minimum % coverage: Minimum percent sequence coverage of query and subject in blast. Use up or down arrows to change the value. The default value is 30%. BLAST E value: Maximum BLAST E value. The default value is 1e-5. Minimum % Identity: Minimum percent sequence identity of query and subject in BLAST. Use up or down arrows to change the value. The default value is 10%. 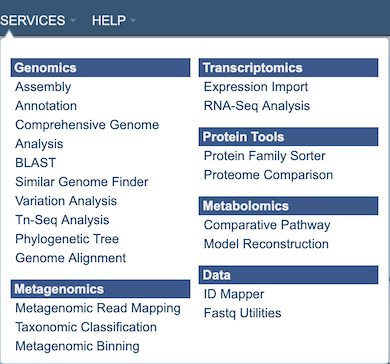 Select a reference genome from the genome list or a FASTA file or a feature group. Only one reference is allowed. Type or select a genome name from the genome list. Select or upload an external genome file in protein FASTA format. 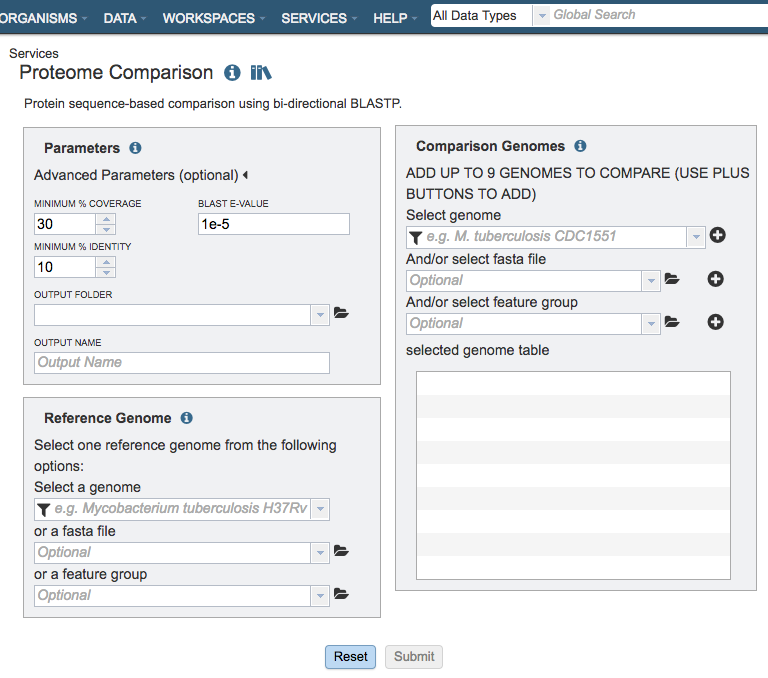 Select a feature group from the workspace to show comparison of specific proteins instead of all proteins in a genome. Select up to total of 9 genomes from the genome list or FASTA files or a feature groups and use the plus buttons to place the genomes to the table . Select a feature group from the workspace. Submit: Launches the proteome comparison job. Upon completion, the result is displayed as an interactive circular genome view and is downloadable as a print-quality image or tabular comparison results.